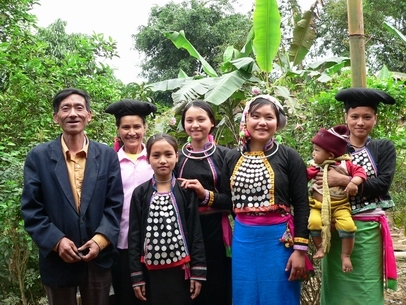 The Si la are also called Cu De Xu who inhabit in three hamlets of Seo Hay, Si Thau Chai and Nam Xin. Muong Te district of Lai Chau province. They have a population of about 600 persons. Si-la language belongs to the Tibeto-Burman Group. The Si la live on rice and corn cultivation of burnt-over land. For some recent decades, they have grown rice in submerged fields. Though agriculture plays a major role, hunting and gathering are also of significance in the life of the Si la. The Si la live in houses built level with the ground. A kitchener is placed at the central bay. Si la women's attire is quite unique. The upper part of their dress is in a different color from the rest and decorated with silver and tin coins. Their headgears vary according to age. When traveling they always carry a woven handbag with red fringes attached to the hems. In the past, Si la men painted their teeth red and women theirs black. Now this custom is no longer observed by the Young people. The Si la have many family lineages. All of them refrain from eating cats. Relationship between the members of a lineage is very closed. The head of a lineage is the oldest man who plays an important role among the members and judges in charge of internal affairs, especially the worship. In Si la society, besides the head of the lineage, the mo (sorcerers) are respected by all. According to custom, the wedding is celebrated in two stages, with an interval of one year. At the second rite, the family of' the groom must hand wedding presents to the bride's family prior meeting the bude and bringing her home. It is also customary that the burial ground occupies a plot at the end of the habitation, in which the graves of the members of the same lineages are grouped. The Si la often build funeral house first, then dig the grave inside of the house. The coffin is made from hollowed tree-trunk. In particular, when a person dies, the Si la organize kinds of entertainment and sing without any cries. They never clean the graves or re-inter the dead remains but still retain the custom of mourning for parents in three. The Si La celebrate many religious rituals, the most important is the worship of the ancestors and the genie of the village. Abstaining is related to agriculture. The life of the Si la is still hard. The distance of communications, the lack of food and clothing, the increase of diseases (popularly goiter and malaria) and state of being born but die at an early age, and the existence of backwardness have made the Si la's life more difficult. An appropriate concern needs to be paid to the Si la group by all levels and branches.